Hurricane Irma strengthened back to a strong Category 4 hurricane before crossing the Lower Florida Keys. It is now moving towards Southwest FL, passing close to Tampa, FL. We continue to see disruptions beyond our control with many of our services throughout the Caribbean Basin, including Central America. Still, we can report that some of our operations are returning to normal. Safety is Crowley’s No. 1 core value, and as such our Emergency Management team continues to closely monitor both Hurricanes Irma and Jose. We are taking all appropriate steps to ensure the safety of personnel, including our mariners, all of our vessels and your cargo. We are coordinating with our vessels to review their routes and plans to keep them well clear of the storms. Our Crowley team has made appropriate preparations at shore-side facilities to protect the safety of personnel, equipment and cargo. The Port of San Juan, PR, is now open to vessel traffic. Our San Juan terminal and logistics facilities resumed normal operations Friday, September 8. Hurricane Irma’s impact on the Leeward Islands, the British Virgin Islands and the U.S. Virgin Islands continues to be assessed. The St. Croix facilities are fully functional. The US Coast Guard has indicated that vessels can come in to St.Thomas during daylight hours only. Transport and logistics services to St.Thomas has now been established from our U.S. and San Juan, PR, terminals. In the Western Caribbean, Jamaica, Haiti and the port of Rio Haina, as well as our terminal and offices in the Dominican Republic, are operating normally. Cuba offices continue to be closed until further notice. The port of Port Everglades, FL, is currently closed. Our Port Everglades terminal, Miami offices and warehouses will remain closed through the weekend. Assessments will be done once the storm passes and it is safe for personnel to enter the facilities. 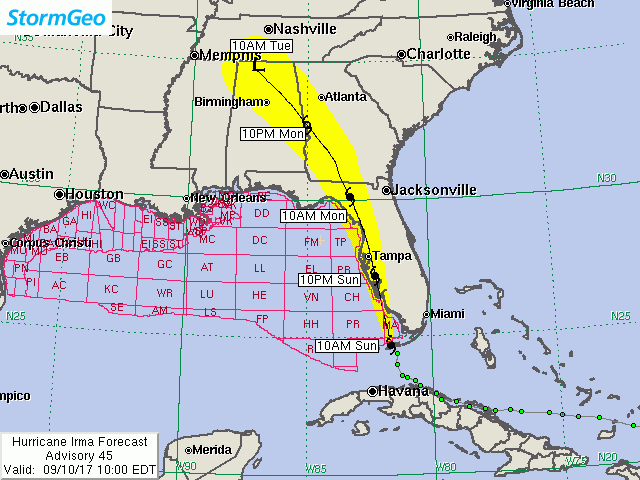 The port of Gulfport, MS, is currently operating under Condition X-Ray, which means that gale force wind conditions are expected within the next 48 hours. We will continue to monitor developments with the port. The port of Jacksonville, FL, is currently under Condition Zulu and all operations have ceased. Crowley’s Jacksonville terminal, offices and warehouses are closed and will remain closed through Monday, September 11. Our Customer Support Center continues to be available during normal business hours. All FEC rail operations in and out of Florida have been suspended until further notice. CSXT has discontinued accepting traffic destined to FEC locations. The Jacksonville rail operations are closed until the stom has passed and safe assessments have been completed. We will continue to update you as port conditions change and as the storms’ trajectories continue to develop. For the latest information on our sailing schedule, please visit Crowley.com. Thank you for your continued support and please stay safe during Hurricanes Irma and Jose.